The road to Hana is one of the most discussed features of Maui. It is quite polarizing as people typically love it or vow they will never do that again. The allure is that the road to Hana is the location of some of the most beautiful and dramatic landscape you will ever see. The downside is that the road to Hana will require a day or two of your precious vacation time. During this time, you will spend a lot of time in a car slowly winding around the coast. Sometimes you are even stopped as you wait for the traffic to clear along one of the sixty-four single-lane bridges. Different accounts claim there are a specific number of turns in the road to Hana. Of course, it depends on where you exactly start your venture and where you end, but I have seen claims as high as 600 total turns made along that journey. When you experience the road to Hana, keep in mind that your purpose should be the “journey” and not the destination. There is much to see along the road to Hana but much less to see in the actual town of Hana. When you get to Hana, you then have two driving options: the first would be to turn around and return on the path you just drove; the second would be to continue on around the southern part of Haleakalā National Park. Both are long drives. Be aware that most rental car companies forbid driving around that southern flank of Haleakalā National Park in their rental cars. Having said that, there are plenty of adventurers that insist on driving through Hana in a counterclockwise direction (using that Southern flank) as opposed to the out-and-back that most tourists do. Here are some tips for your road to Hana adventure. Most of them are optional, but the first one is a must. Leave early—before 8 a.m. would be my suggestion. You will find yourself part of a long string of cars driving to Hana. It is better to be in the front rather than the middle of that string. And that string does include tour busses. The earlier you leave, the less you will need to “jockey for position” throughout your day. There are a limited number of restrooms on the road to Hana. When you see one of them, seriously consider taking advantage of it. Radio signals don’t reach much of the Hana Highway, so bring along some Iz CDs or buy one of the many road to Hana tour CDs for narration. Most of them are quite inexpensive. It takes a full day to drive from one of the resorts on the west side of Maui over to Hana and back. Some folks spread it out over two days. The strategy is to drive to Hana, spending a lot of time along the way at places such as Wai`anapanapa State Park. Then, spend the night in Hana, visit some of the places south of Hana such as `Ohe`o Gulch, and drive back that second day. Many people like the thought of driving the road to Hana in a convertible, which gives you wide-open views of the beaches and lush valleys you will be passing. Keep in mind that you will probably not feel the cool breeze in your face as you putt along at 20 miles per hour. That Hawaiian sun will be beating down on you too, so put on your sunscreen or put up the top for a portion of your trip. If the thought of driving all day on a winding road doesn’t fully appeal to you, consider taking in just a portion of it. One trip, we took in about a quarter of the distance in a morning and hiked to a waterfall, then we drove to the airport and flew home. It was a much better way to spend our morning than just waiting around in the airport. 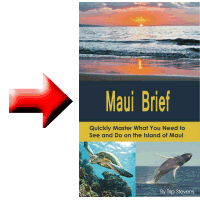 This tip goes without saying and may apply to anything on Maui: Wear your swimsuits as you will be surrounded by the ocean and pools at the bottom of waterfalls. After driving for an hour or two, you will welcome a quick dip. If you want to experience the road to Hana but don’t want to drive yourself, there are plenty of tour companies that will sell you a seat on their tour bus. The tradeoff is that you stop where the bus stops and for as long as the bus is stopped which may or may not align with your preferences. Pack lots of food. Predicting when and where to stop for meals on the road to Hana is not a fruitful exercise. 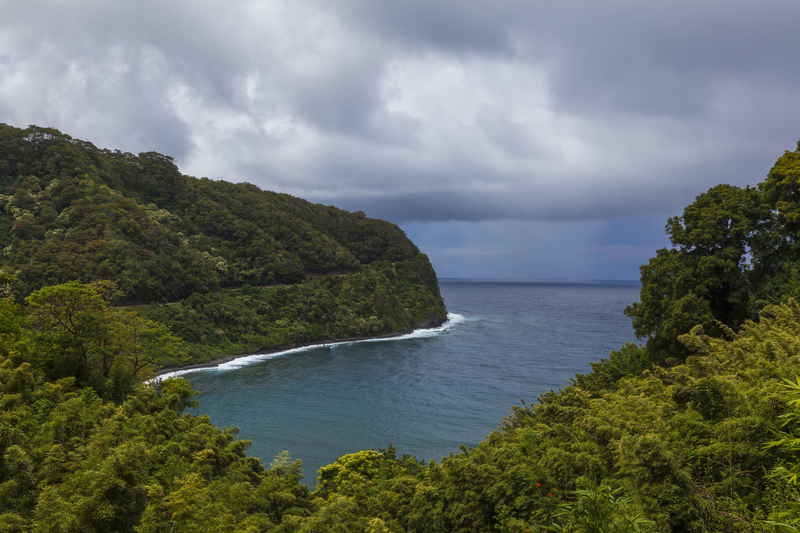 It is best to drive the road to Hana during the week—you will find fewer crowds. Of course, that is the advice for any Maui activity so prioritize accordingly. Don’t go on private property. Whether it is clearly marked as private property or you are simply wondering if it is, leave it alone. Show respect for the locals and their property. Remain in areas that are obviously public property. While there is plenty to see on the road to Hana, there are a few highlights that should be pointed out. Depending where you start your journey, you should stop at Ho’Okipa State Park to watch the surfers and windsurfers. You could visit this park on another day but should see it at some time while visiting Maui. You should also stop at the Wailua Valley lookout. It has its own parking lot, and on a clear day you can see all the way to the Ko’olau Gap of Haleakalā Crater’s rim. Also a “must-stop” is at the black sand beach at Wai’anapanapa State Park. This is a unique place and usually comes when everyone is ready for a break. The last spot you should plan on seeing is the Seven Sacred Pools in `Ohe`o Gulch, just beyond Hana. This is a series of cascading waterfalls that is stunning. Along with my advice of what you should see, I must throw in a feature to avoid. At this time, I would stay away from the Blue Pool. I have been there several times and indeed the place is very beautiful, but now it is not a tourist-friendly spot. I visited there through the ’90s and it was a great stop, but hostilities have mounted since then and there are reports of locals threatening tourists with guns and pelting tourists with mangos. If you need further convincing, read about others’ visits to the Blue Pool.